As I wait to hear back on job applications and interviews, I will admit that I have been going a bit stir crazy in Spartanburg, South Carolina. It has been a slow and painful process. On the one hand, I am thrilled that I have the chance to spend time with my family (who I didn’t have the chance to see for months and months while I was in Europe.) On the other hand, I am just ready to start a new phase of my life. My grandfather provided this metaphor as encouragement: It is like I am in a plane circling over the airport above the storm, waiting for the chance to land. Yes, it is beautiful and enjoyable looking out of the windows looking out onto the white tops of the clouds, however, all I can think about is getting back on the ground. In the midst of these days, I will admit that it has crossed my mind more than once to cash in my few assets and just “run away” to an exotic place in search of an adventure. I figure that I would be fine – I speak four languages enough to get by (understanding the basics of another two languages) and I know people all over the world. I often get these notions in the middle of the night and by the time the daylight enters into the sky, I realize how irresponsible and inconsiderate these ideas are – despite how exciting they may be. Being reunited with my family has made me realize that some of the most worthwhile adventures in life are not the most exotic adventures to be had. In the past two months, I have met my newborn cousin for the first time, vacationed at the beach twice, picked apples at an orchard in the NC mountains, cheered for my team at a US football game, attended art shows, and have shared some of the most special meals and encouraging conversations with friends and family. When I look at my life through this lens, I feel quite blessed with these everyday adventures. And so, I try to make the most of each day with my family. And I plug away at my job search day after day, using my resources to occasionally go to different cities for job interviews and meetings. 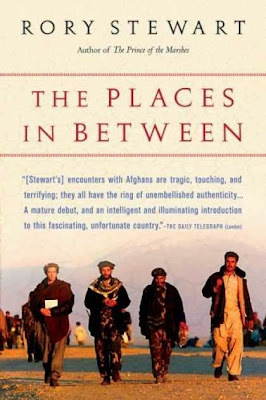 It was with these thoughts of “running away” and “everyday adventures” that I read The Places In Between by Rory Stewart. This book chronicles the author’s journey as he trekked across Afghanistan in early 2002 following the fall of the Taliban. The author admits that “Perhaps I did it because it was an adventure” (page xi) to follow in the path of Babur, the first Emperor of Mughal India. “Why did you become a Mujahid?” I asked Seyyed Umar. “Their objective was (to quote the United Nations Assistance Mission in Afghanistan) ‘the creation of a centralized, broad-based, multi-ethnic government committed to democracy, human rights, and the rule of law.’” (page 245) This book, however, exposes the challenges which initially existed in regard to achieving this goal and provides an excellent basis by which to understand Afghanistan today.